Calcific tendonitis is a musculoskeletal condition affecting the rotator cuff, causing pain and immobility of the shoulder. 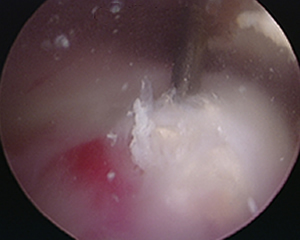 Conservative treatments are often successful; however, some cases may require arthroscopic surgery to remove calcium deposits and bony outgrowths. For more treatment information, schedule an appointment at Dr. DuBois’ La Mesa, CA offices. The shoulder's complex anatomy makes it susceptible to a number of painful conditions affecting the joint's ligaments and tendons. One condition, calcific tendonitis (also known as calcifying tendonitis or calcium hydroxyapatite crystal deposition disease), is a form of tendonitis that is characterized by the presence of calcium deposits in the rotator cuff tendons. Patients will experience pain and inflammation as a result of calcium deposits being absorbed into the tendon. Though the condition is not entirely understood, it is thought to be a result of shoulder compression, arthritis, or metabolic factors that also put patients at risk of developing diabetes. Calcium deposits in the rotator cuff are usually around 1-2 centimeters in length, and reduce the amount of space available through which the rotator cuff passes. This inhibits rotator cuff function, causes chemical irritation, and can lead to shoulder impingement, a tendon condition that may require surgery to fix. On an x-ray image, calcific deposits are seen as lumps, or cloudy areas on the rotator cuff. Ultrasounds are more sensitive than x-rays in detecting calcification, so patients may be advised to pursue additional imaging to confirm the diagnosis. Calcific tendonitis typically occurs in patients over 40, with women at a greater risk of developing the condition. Diabetic patients typically have a higher occurrence compared to other patients, as well. When symptoms are present, patients will experience pain by using the affected shoulder to elevate the arm, or by lying on the affected arm during sleep. Calcific tendonitis progresses predictably, and has three stages: pre-calcification stage, the calcific stage, and the post-calcific stage. Symptoms are only present during the calcific stage, when the calcium deposits are re-absorbed into the rotator cuff, building pressure and causing pain. The painful calcific stage lasts approximately 1-4 weeks, after which the condition may resolve itself. Patients are most likely to seek treatment during the resorptive stage of calcification, when symptoms are most noticeable. 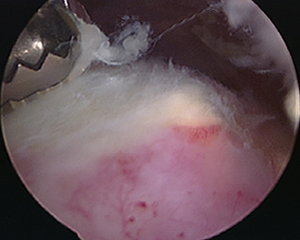 Because of the "silent" nature of calcific tendonitis, some patients may discover the existence of calcium deposits on the rotator cuff as a result of comorbid (compounded) conditions, such as impingement syndrome. Traditional treatment usually involves a combination of physical therapy, cortisone injections, and anti-inflammatory medication. These solutions reduce patients' pain by managing painful symptoms; however, they do not cure the condition. Surgery is recommended when symptoms persist and progress despite treatment. A minimally invasive approach known as needling, in which the surgeon mechanically breaks down calcium deposits with a needle, can help reduce pain and restore range of motion. In tandem with an ultrasound machine, the shoulder surgeon is able to visualize the needle entering the deposit in real-time. The shoulder surgeon may recommend a procedure known as arthroscopic debridement to treat calcium deposits affecting the rotator cuff. During the procedure, the surgeon uses small instruments to remove inflamed or scarred tissue, as well as bone spurs, in the area. This procedure increases the amount of space available for the rotator cuff tendons to pass through. Dr. Benjamin DuBois is one of San Diego’s leading shoulder specialists, and is fellowship-trained to perform corrective shoulder and elbow surgery. With state-of-the-art technology in-office, including a shoulder MRI and ultrasound machine, Dr. DuBois is equipped to treat patients in the most comfortable, convenient environment available. For more information about shoulder pain treatment, schedule an appointment with Dr. DuBois.